The Bureau of Labor Statistics (BLS) today reported an unemployment rate of 2.9% for November, an increase of 0.1 percentage points from October. Older workers are benefiting from a historically low unemployment rate. Now is the time to prepare for older workers’ higher risks in recessions. 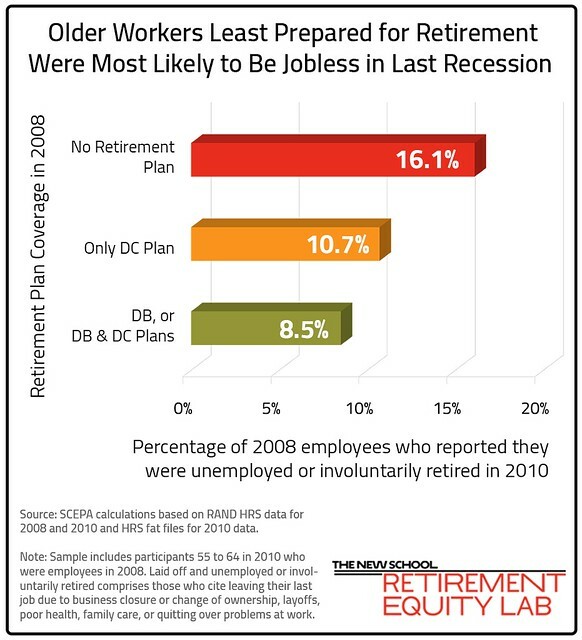 Older workers least prepared for retirement are most likely to end up jobless in a recession. During the Great Recession, 16.1% of older workers without retirement plan coverage lost their jobs and either remained unemployed or retired involuntarily. Those with coverage fared better - 10.7% of those with a 401(k)-type defined contribution (DC) plan and 8.5% of those with a defined benefit (DB) plan were unable to find a new job. Even workers on track for a secure retirement aren't out of the woods. If they lose their job, they likely stop saving for retirement and may have to draw down assets prematurely, putting them at risk of outliving their wealth. To protect older workers from the effects of unemployment or involuntary retirement, including downward mobility and poverty, we need to ensure workers have bargaining power. Bargaining power allows older workers time to seek a good job, negotiate better pay and working conditions, or choose to take a dignified retirement. ​To ​ensure a dignified retirement​ for all, we need ​to expand unemployment insurance, Medicare, Medicaid, and Social Security ​and create Guaranteed Retirement Accounts (GRAs). GRAs ensure all workers a secure path to retirement by providing universal, secure retirement accounts​. GRAs are professionally managed,​ funded by employer and employee contributions​ - ​paired with a refundable tax credit​ - and provide monthly benefits for life. 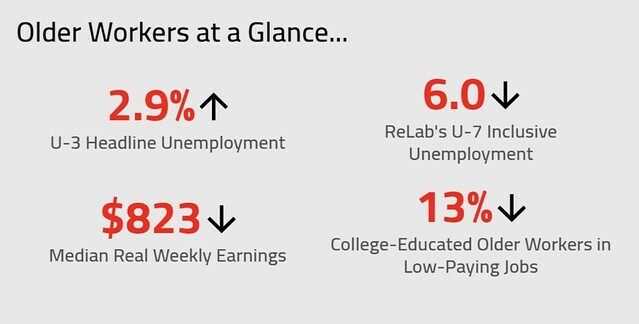 *Arrows next to "Older Workers at a Glance" statistics reflect the change from the previous month's data for the U-3 and U-7 unemployment rate and the last quarter's data for the median real weekly earnings and low-paying jobs. The Bureau of Labor Statistics (BLS) today reported a 2.8% unemployment rate for workers age 55 and older in October, which reflects no change from September. The headline rate remains near a record low, as it has for a year. Despite reports of a hot job market for older workers, older Americans are not being lured back to work. 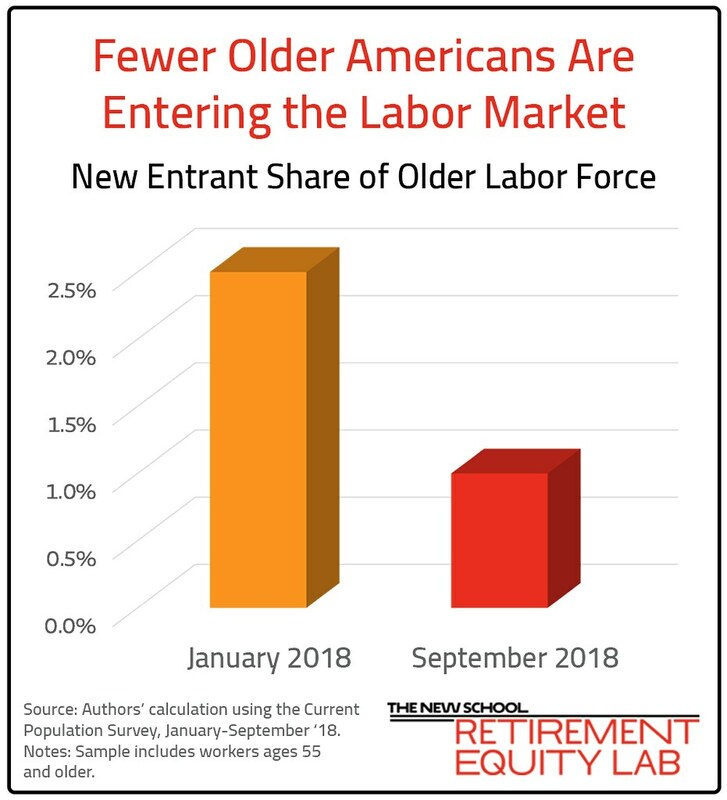 At a time when economists would expect new entrants* to the labor force to be increasing, the share of new workers in the older workforce fell last month by over half from the beginning of 2018, from 2.5% in January to 1.0% in September. The drop in new entrants could mean the labor market has absorbed almost all the older people who want a job. That would be good news, but our evidence points in another direction. The share of older people who want a job but don't have one (ReLab’s U-7) has not recovered to pre-recession lows. At 7.4%, U-7 is 0.8 percentage points higher than the pre-recession low of 6.6%. Even for the college educated, U-7 is 6.8%. There are two main reasons why older workers are not entering the labor market. First, older Americans, especially older women, face age discrimination in the hiring process, which discourages job search. Second, most jobs created in the recovery have been low-paying, low-quality jobs, including contingent and alternative jobs. This evidence does not support the belief that the retirement crisis can be solved by working longer. To ensure workers can retire in dignity, policymakers should expand Social Security and create Guaranteed Retirements Accounts (GRAs). GRAs are universal, secure retirement accounts funded by employer and employee contributions throughout a worker’s career paired with a refundable tax credit. These policies will help prevent downward mobility in the event of involuntary retirement. *New entrants are defined as those previously not working who found a job in the last year. 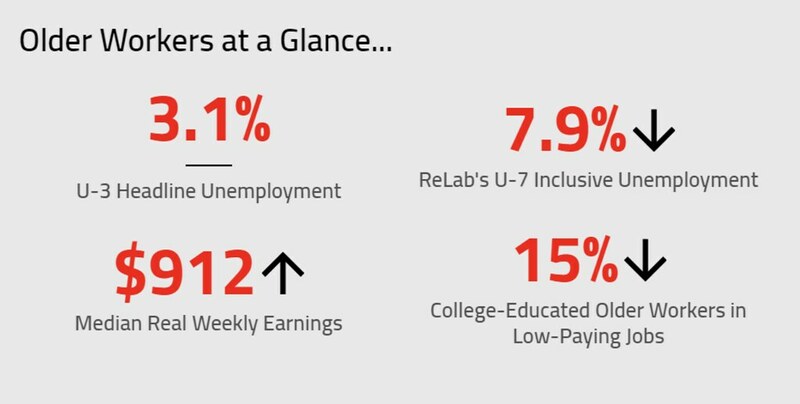 **Arrows next to "Older Workers at a Glance" statistics reflect the change from the previous month's data for the U-3 and U-7 unemployment rate and the last quarter's data for the median real weekly earnings and low-paying jobs. The Bureau of Labor Statistics (BLS) today reported a 2.8% unemployment rate for workers age 55 and older in September, a decrease of 0.3 percentage points from August. Despite the low headline unemployment rate, many older workers leave the workforce involuntarily. Older workers often need to continue working to make up for inadequate retirement savings due to lost pensions and inconsistent employer contributions. 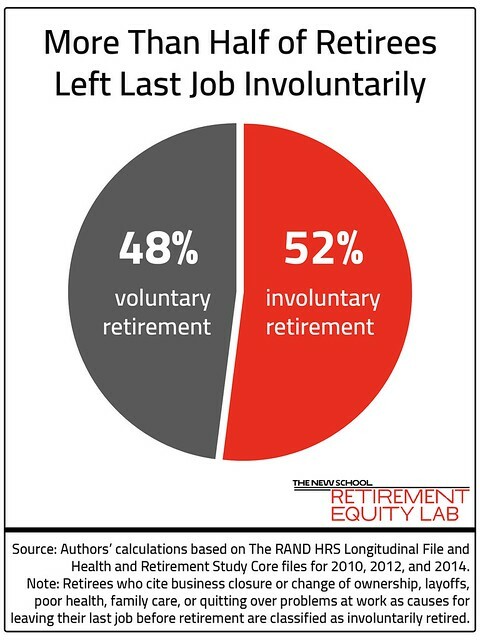 Yet, from 2008 to 2014, at least 52% of retirees over 55 left their last job involuntarily, the result of job loss or a deterioration in health. Those pushed into retirement early face barriers to returning to work. They are likely to be unemployed longer than younger people, and when they find a job they will earn on average 25% less than their previous salary. Working longer is not a solution to the retirement savings crisis. Workers cannot rely on being able to work until they are ready to retire. Those who have inadequate retirement accounts and leave the workforce involuntarily are at risk of being downwardly mobile and falling into poverty. To ensure people can retire when they need to without experiencing deprivation, we need to strengthen Social Security and create Guaranteed Retirements Accounts (GRAs). GRAs are universal, secure retirement accounts funded by employer and employee contributions throughout a worker’s career paired with a refundable tax credit. Together, these proposals would allow all Americans access to dignified retirements after a lifetime of work. The Bureau of Labor Statistics (BLS) today reported a 3.1% unemployment rate for workers age 55 and older in August, which represents no change from July. Although the economy is still expanding, the fastest-growing job sectors for older workers pay wages so low they claim food stamps. At just $23,200, the median wage for health and personal care aides is below the national average of $31,100. 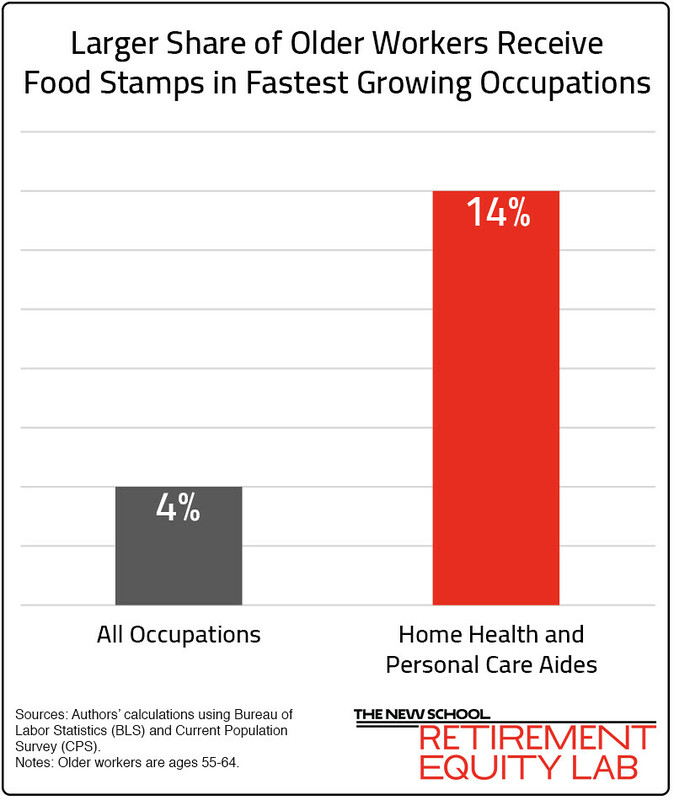 Their wages are low enough that 14% of older workers employed as health and personal care aides claim food stamps, compared with 4% of all older workers. Aiming to curtail public subsidies to employers who pay low wages, U.S. Senator Bernie Sanders and U.S. Representative Ro Khanna introduced legislation to recapture from companies every dollar their workers receive in public assistance. In the meantime, the growth of low-wage work for older workers leaves many near-retirees unable to afford food, let alone save for retirement. Expanding Social Security and creating Guaranteed Retirement Accounts (GRAs) will ensure older workers are not stuck in low-wage jobs because they can’t afford to retire. GRAs allow workers to save in safe, efficient investment vehicles over their lifetime. *Authors' calculations using Bureau of Labor Statistics (BLS) and Current Population Survey (CPS). We love our kids, but they can ruin retirement. As we face the consequences of a systemic failure of our retirement savings system, near-retirees have an average savings of only $15,000. When you couple parents’ inadequate savings with their children’s increasing costs for tuition and housing, you have a dangerous cocktail. [tweet_quote display="Raiding your retirement funds for adult children can leave you dependent on them in old age. Housing is one area where older people are likely to provide their children with help financially. If you have millions saved, it may not matter. But if you are like most people with less than $2-3 million saved for retirement, taking money out of these funds to help an adult child may be bad for you both down the line. Adult children’s financial dependency on elderly parents can even come with the fault lines of regret and tension. The Bank of Mom and Dad study by the for-profit online rental company Apartment List found in a nonscientific sample that 8% of non-student millennials (the 70 million+ American adults born between 1982 – 2000) have family members pay for their monthly rent. In addition, 17% expect financial help from family towards a down payment. Those numbers aren't large, and the poll isn't scientific, but I worry from other research that retirement accounts are tapped for family needs to the peril of the retiree. But, I stress it is the system at fault here, not the saver. Prices of homes where the jobs for young people are out of sight. Facing high housing costs is not the fault of the victim. High housing costs is not the fault of the victim who can't afford to buy a house like some argue. For example, a millionaire Australian started a meme in May 2017 excoriating millennial adults for their profligacy. Avocado toast was the stand-in product, implying an entire generation sacrifices home investment for short-term luxuries. The meme was quickly disabused a few days later. The BBC calculated the avocado toast index, counting the avocado toasts equal to a down payment for a starter house located outside various city centers. In Johannesburg, it was 3,700 avocado toasts. 11,000 in San Franciso. You get the picture. Most observers do not blame the low rate of home purchases on millennial spending. Rather, they point the finger at a combo of the current state of home ownership with the state of the labor market for millennials. For example, since 2000, home and rent prices increased by an average of 67%, while millennial’s income increased only 31%. Nicole, an employee of Apartment List, told me she works hard and is a cautious spender. But recently, she asked her parents for the first time for the deposit and down payment she needed for a small room in a big house in San Francisco. Economists advise young people to move to find a better job but moving is tough. Nicole said her move from Boston required upfront expenses she couldn’t afford: first month’s rent ($1,200), the deposit ($1,250 each), the broker fee ($1,250), on top of the $3,000 for the move itself. And a door for the room, since it wasn’t really a room. Her parents gave her $5,000, which came out of their savings for a trip to Hawaii for their 25th wedding anniversary. Nicole’s parents were lucky. They just delayed their trip. But some parents are sacrificing their finances in old age by giving money to their adult kids. Nerd Wallet, a for-profit personal finance website, found parent’s retirement savings could be $227,000 higher if they chose to save the money that would otherwise go to their child’s living expenses and tuition. Given the median retirement balance for older (age 55-64), upper-middle-class Americans (in the 60 – 90% of the income distribution) only have $100,000 in their retirement accounts, $227,000 makes up a big chunk. Nerd Wallet also found 28% of parents of children 18+ are paying or have paid for their adult children’s tuition or student loans. “The average parent takes out $21,000 in loans for their child’s college education.” The hit to their retirement savings is almost $80,000. Many parents of children 18 and older are paying or have paid for their adult children’s basic living costs, including groceries (56%), health insurance (40%), and rent or housing outside the family home (21%). About 39% cover or have covered their adult child’s cell phone bill and 34% of their car insurance. The rise of individual retirement accounts makes it easy to spend retirement money on adult kids. You can’t drain your defined benefit, Social Security, or Medicare accruals for your adult child’s cell phone bill. But you can take out money – after paying a penalty – from a 401(k) or IRA. And there are hardship withdrawals as large as a remodeled kitchen after the popcorn burns in the microwave. Sometimes hardships are for home repair, which allows people to use retirement accounts like any another checking account. Kids and parents should know they will both pay high costs over time if retirement accounts are drained now to pay for expenses like college tuition. Parents who give to adult children often expect a payback in old age. Sometimes the expectation is said in jest, as in, “if I send my kid to an expensive college then she will be a doctor; I can live in the back bedroom.” The imagined deal covers up the anxiety of an uncertain future. Not many people become doctors. In fact, only 68% percent of college freshman finish with a college degree. A program that lends money to parents for college tuition, called PLUS loans, can trigger the garnishment of parent’s Social Security checks, tax refunds, and wages if they experience a financial shock. Even some college graduates regret taking out so many loans for an expensive college. The increasing costs of housing and college, changes in pension plan design from accrued annuities to lump sums, and easy loans play a big part in draining on older parent’s finances. But parents also financially provide for their adult children as an act of love. Please do help your children with college expenses and supplement a rent check or coinsurance payment. But rob your vacation and your red quinoa or steak dinner budget instead of taking from your future livelihood. One of the best things you can do for your kids is take care of yourself.